Two things are sure to diffuse any January induced mid-winter blues for me: an episode of Death in Paradise and an afternoon spend perusing seed catalogues. As bad mood remedies are best served doubled up, I decided last Monday afternoon to indulge myself in both, settling myself in with the bag of last year’s left-over seeds, pen and notebook, a cup of tea and the latest case of Saint Mary’s police department. 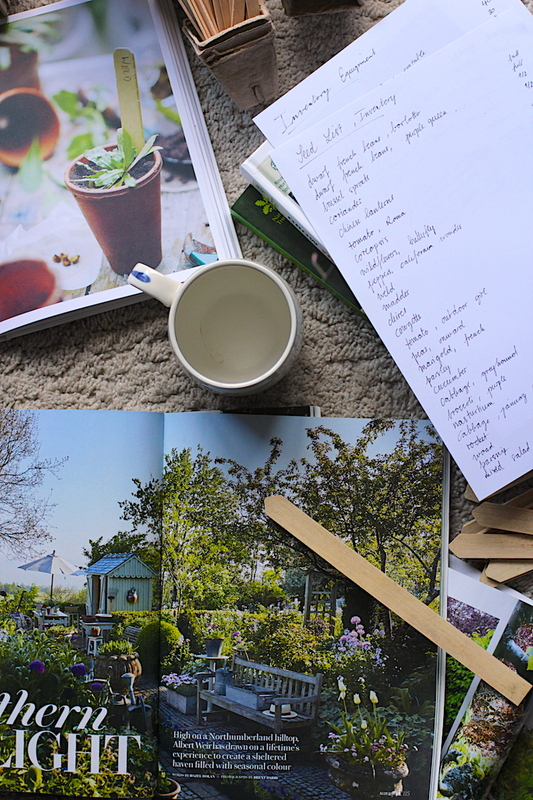 If you’ve never delighted yourself in plotting and planning for a summer’s garden in the middle of the dark days, I can highly recommend. The stunning cut flower displays and brimming vegetable beds that emerge on the paper once I’ve got seed lists ready and crayons at hand are certainly something. Unfortunately though, the hopeless optimist that I am, winter has always proven to be my best season as a gardener so far. Most of my elaborate plans made in January were soon thwarted by the distractions and diversions of every day life, sometimes leaving us only with a handful tomatoes and strawberries come summer. Yet, from the view point of my sofa the allotment looks once again at its most colour- and bountiful. 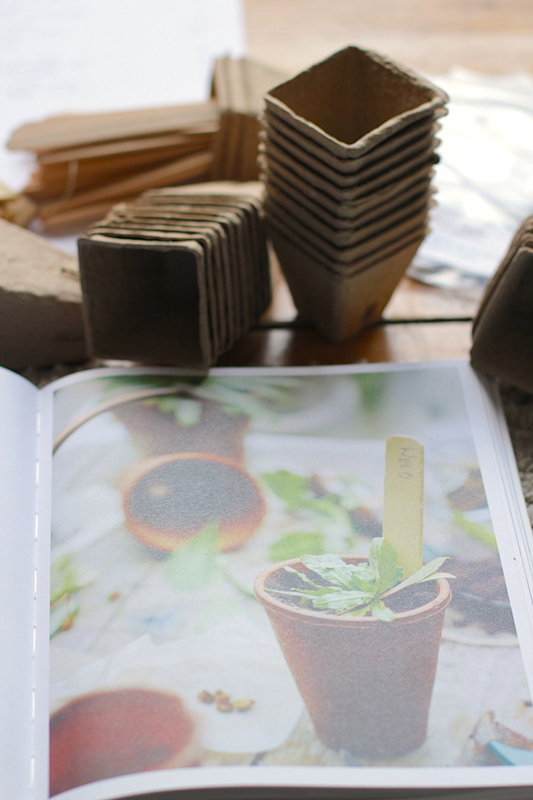 On paper it’s going to be our biggest gardening year so far. As over the last few months I’ve managed to finally extend the original path deep into the previously untouched areas of the allotment. For the first time since we took the land on, we will have unobstructed access to two-thirds of the entire plot! Enough space for ALL my plans: : crop rotating vegetable beds, a herb garden, cut flowers and a corner for natural dye plants. Did I mention I’m an incurable optimist? And also a typical ENFP? Yes, Myers Briggs knows, that I will – for the sake of bold dreams and homemade baked beans – repeatedly plant more than I can water like a novice gardener. Just ask last year’s Borlotti bean seedlings which were left to rot in the greenhouse, forgotten in the rush to get the tomatoes in. The problem is, really, not time but focus. 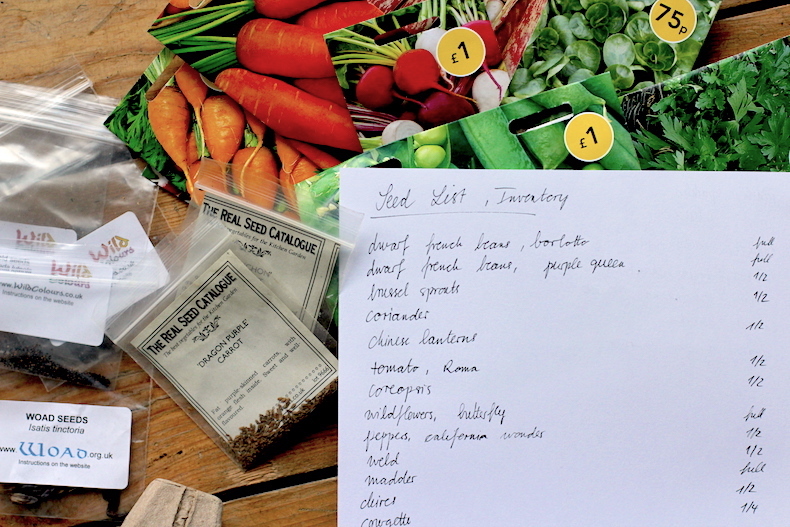 While a bountiful vegetable garden doesn’t necessarily require much attendance, the little it gets, must first zoom in on the many seasonal priority tasks in order for it to truly shine. True to my type, I tend to ignore the little administrative acts of care by getting caught up in the scheming of bigger projects. Or even better, going on holiday in the middle of a heatwave with a greenhouse full of needy seedlings. Yes, that has happened too. 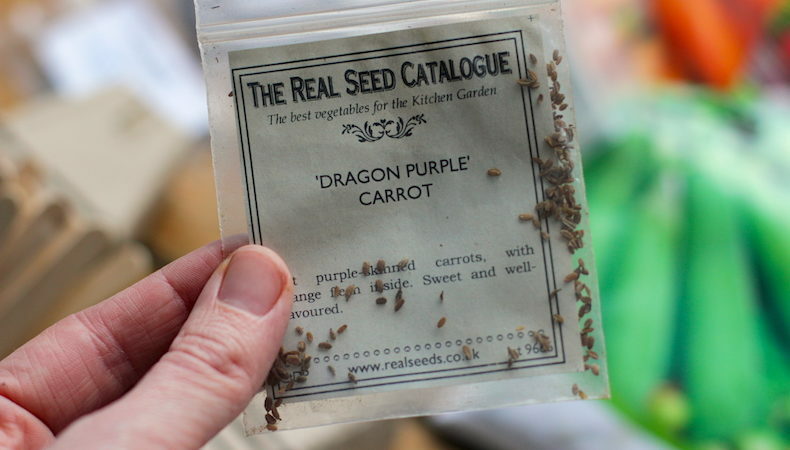 Moments before the murderer got revealed on the telly, I made a discovery of my own: A forgotten packet of the delightfully purple ‘Dragon” carrot seeds on the bottom of the bag. Weighing the small pack in my hand, I imagined the juicy, sweet carrots crunching between my teeth and suddenly couldn’t help the urge to believe that this year will be different. Because apart from the new path something else is new for this season: Since August the allotment has become a strong fixture in our weekly rhythm, with dutiful visits at least once a week. A little goes a long way; isn’t that what they say? And also, a girl can dream. Right! ?